A couple of miles to the south west of Maentwrog we come to the church of St Tegwyn (also written as Tecwyn) at Llandecwyn. Tegwyn is supposed to have arrived in the area with Cadfan and a number of others who have left dedications in the area. Some writers have suggested that he and Twrog were brothers, although this is not a common belief, one thing they did have in common was the large stone that bore their name. 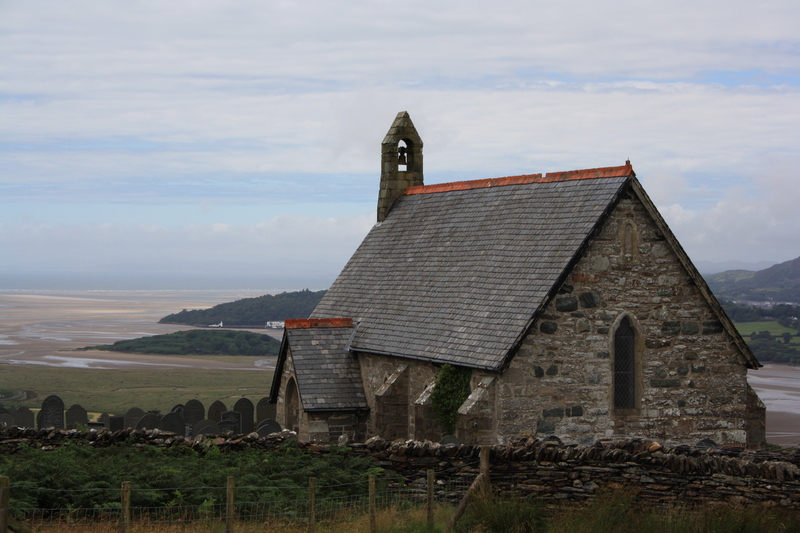 However, whilst Twrog’s stone remains beside his church, Tegwyn’s was apparently broken up at some time during the eighteenth century to be used to construct a new barn. The church too, is of relatively recent construction; the previous church was completely demolished and rebuilt around 1879. There is one small inscribed stone built into the new church wall that dates from one of the previous buildings commemorating St Tegwyn. Ffynnon Degwyn is by Plas Degwyn not far from the church. Near Plas Llandecwyn is a spring which flows into a cavity about 3 feet at the front and 2 feet at the back by a breadth of 21 inches; the water stands in its rock cistern to the depth of 14 inches and as there is a slight but steady flow the water is kept sweet. There can be little doubt that this is the well noted by Lhuyd, but the name of Tecwyn is not now connected with it. The grid reference provided in the Coflein inventory for this site is SH 63173742. 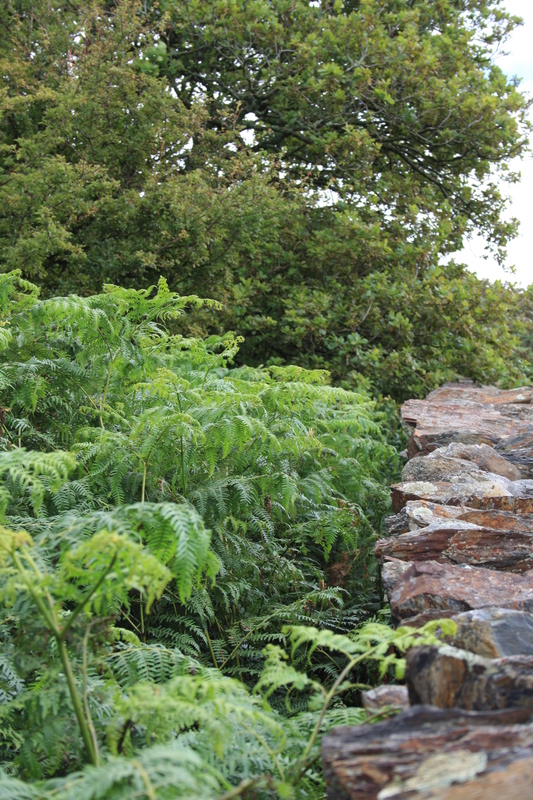 This area is shown in the photograph below, and can be seen to be completely covered in bracken. Despite our best efforts we could find no trace of the feature described in 1914. If since that period the spring has been diverted to provide for Plas Llandecwyn then it is quite possible that the remains of the spring no longer exist. This well would appear to be another example of when whatever community once existed around a now very isolated site dispersed then the folk memories associated with the landscape died too. The stone and well both lost any special associations and were readily reused as more immediate needs prevailed. As a result I am unable to find a record of any particular practices associated with the well. The Inspecting Officer’s attention was directed to a spot about 330 yards north east of the church where is a hole about 21 inches square cut into the rock at the level of the road, water dripping within and overflowing the road. We were unable to find this feature during this visit. I did eventually find the well, but after discussions with the owners chose not to post photographs here. I live not far from the church, and I am a hydrologist! There is a little confusion between the two locations. One, which the locals tell me is Tecwyn’s well, is due south of the church not too far from your photo, and it does indeed supply water to the farm / holiday cottage Plas Llandecwyn. I’ve not seen it myself. The other, “about 330 yards north east of the church”, I have looked for and failed to find, but have now located it. It’s a covered cistern in a rock niche which is now piped under the track and thence off across the fields. I can photograph it if you want. Ian – thank you. I will go back for another look myself at sometime, but a picture i can use, or details of what I would be looking for would be great.